General Information: The following is from an extraordinary book by Kasma Loha-unchit, It Rains Fishes: Legends, Traditions and the Joys of Thai Cooking, published by Pomegranate Artbooks, 1995. 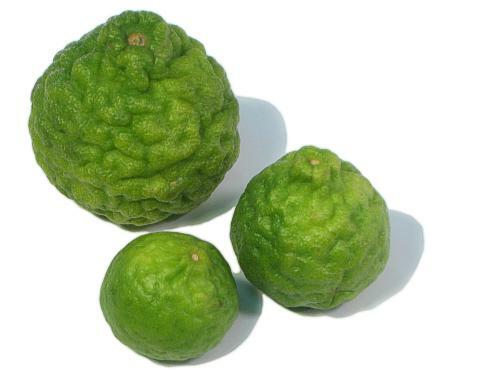 Besides supplying great flavor ingredients to enhance food, kaffir lime is also used as a indisputably effective cleanser, natural deodorizer and add a sparkling scent, like sweet bouquet of citrus blossoms, and each scratch of the zest releases another installment of refreshing perfume. Kaffir lime shampoo leaves the hair squeaky clean and invigorates the scalp. It is believed to freshen one's mental outlook and ward off evil spirits. Kaffir lime has also been used for ages as a natural bleach to remove tough stains.